The ‘Diriya Kanthawa’ award, which celebrates the contribution of female workers across various industries, has become a pinnacle recognition, because it is a decisive endorsement of the invaluable contribution made by female workers towards the nation’s economy. The ‘Diriya Kanthawa’ winner brings fame not only to the company she works for, but also brings repute to the industry she belongs to. For the first time since the award’s inception, this year’s Diriya Kanthawa winner is from the apparel sector – Shanthi Dissanayake – Senior Supervisor, Hirdaramani Knit factory based in Wathurugama. As a contributor to the apparel industry, her triumph is seen as a celebration of the majority of the female workforce that has brought the apparel sector to earn the status of being the number one foreign exchange earner for the country. Utilising the largest female workforce, providing direct employment opportunities to approximately 300,000 women and resulting in an inflow of over $5.2 billion in export revenue in 2018, the apparel industry is the first industry in the island to cross the $5 billion mark. This award reflects the value Shanthi and the thousands like her bring not only to the workplace but also in their personal lives. By doing this not only they improve the quality of life for their families, but also prove to be a source of inspiration for her community and peers. The ‘Diriya Kanthawa’ award was presented to Shanthi on the occasion of International Women’s Day 2019 by Independent Television Network (ITN) Ltd. The judging process for the ‘Diriya Kanthawa’ award is an arduous one, as the winner is selected by an independent panel which evaluated over 100+ applications sent in from across all industries in the country. To stand-out from so many applicants requires an outstanding achievement. The ‘Diriya Kanthawa’ winner Shanthi Dissanayake has demonstrated exceptional commitment and determination to excel in the workplace while simultaneously providing a better future for her family through her hard work, self-belief and resilience. She joined Hirdaramani as a Helper in the year 2000 and has not looked back since, rising swiftly to become Senior Supervisor – Production by 2013. On the personal front, through her earnings she was able to build a house for her family and expand it at a later stage. She went on to buy an 80-perch land and even bought a three-wheeler for the family. Inspired by her mother’s example, her daughter gained entry to the University of Ruhuna to pursue higher studies. She credits her success to her family, supportive colleagues and to the management of Hirdaramani who supported, trained and encouraged her to keep aiming higher. The empowering work culture at Hirdaramani ensures her contribution is respected and valued. Employees at Hirdaramani receive continued guidance and support to achieve their full potential through training resources and wellbeing tools which focuses on personal and career development. “We are very proud of Shanthi’s exceptional achievement in winning the Diriya Kanthawa award. She is a dedicated and persevering individual who has added value to her life, family and the workplace since joining Hirdaramani in the year 2000. Women are at the heart of the apparel industry, role models of courage and the corner-stones of the family and community. We are glad that this award will highlight the massive contribution made by the female workforce in driving the apparel industry to earn the reputation it enjoys today. 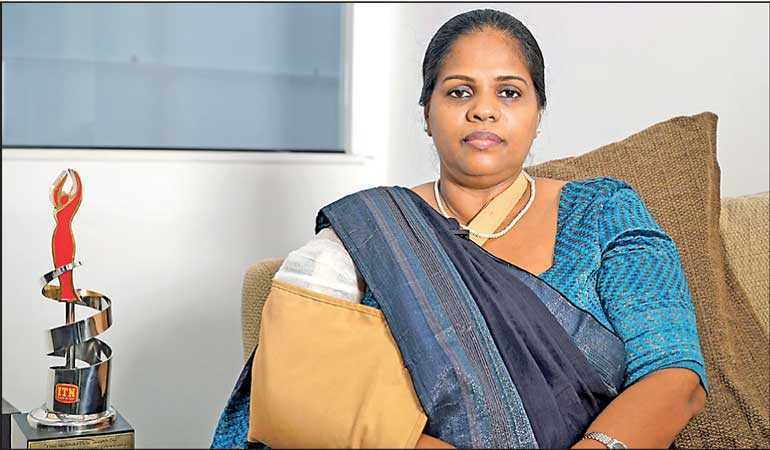 We see Shanthi’s triumph as a win not only for herself and Hirdaramani Group, but also for the apparel industry a whole,” says Hirdaramani Knit Cluster Chief Human Resources Officer Chamindra Perera Dassanayake.